Kirtland’s Warblers are at their all-time high in Michigan. Photo: U.S. Fish & Wildlife Service. 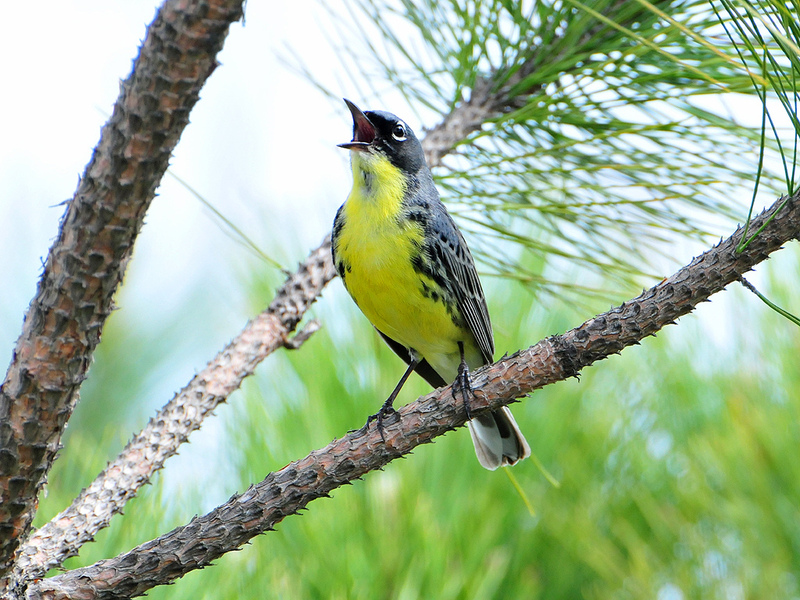 Michigan’s Kirtland’s Warbler population has reached an all-time high, according to Dan Kennedy, the Michigan Department of Natural Resources endangered species coordinator. “We are witnessing a conservation success story,” Kennedy said. The agency recently released the results of its annual Kirtland’s Warbler survey. The warbler is a federally endangered bird. Surveyors, including biologists, researchers and volunteers, observed 2,063 singing males during the official 2012 survey period. That compares to 1,805 males in 2011. DNR wildlife officials say it is the largest single-year jump since 2007. At low ebb, in 1974 and 1987, only 167 singing males were found in Michigan. Singing males were found in 12 northern Lower Peninsula counties this year Another 38 were found in seven Upper Peninsula counties. The warbler’s comeback is attributed to active jack-pine management on state and federal lands. The warblers are ground nesting birds that prefer four to 20-year-old jack-pine. Approximately 3,000 acres is cut and replanted every year. The process mimics what once happened naturally, but caused by fires on the landscape before fire-suppression measures became the norm. This entry was posted in Uncategorized and tagged Birds, Conservation, DNR, Endangered Species, Environment, Kirtland's warbler, Nature, Warbler. Bookmark the permalink. Great photo. I find birds hard to photograph as they tend to move around so much.